Fresh Cherry Berry Crumble Bars make the perfect easy summer treat. Filled with a sweet and juicy cherry & triple berry filling. Best of all with this simple recipe, the buttery oatmeal streusel crust doubles as the topping. My favorite part about summer is all the fresh cherries and berries. I can never get enough and most of the time we just enjoy them straight from the bowl but at least once a year, I love tossing whatever summer fruit I have on hand together with a buttery streusel crust. Fruit crumb bars are my favorite baked dessert and although I have been trying to avoid turning on the oven during the summer, they are absolutely worth heating up the house for. They are one of the easiest desserts to make from scratch and are such a great way to highlight the wonderful flavors of your favorite summer fruits and berries. 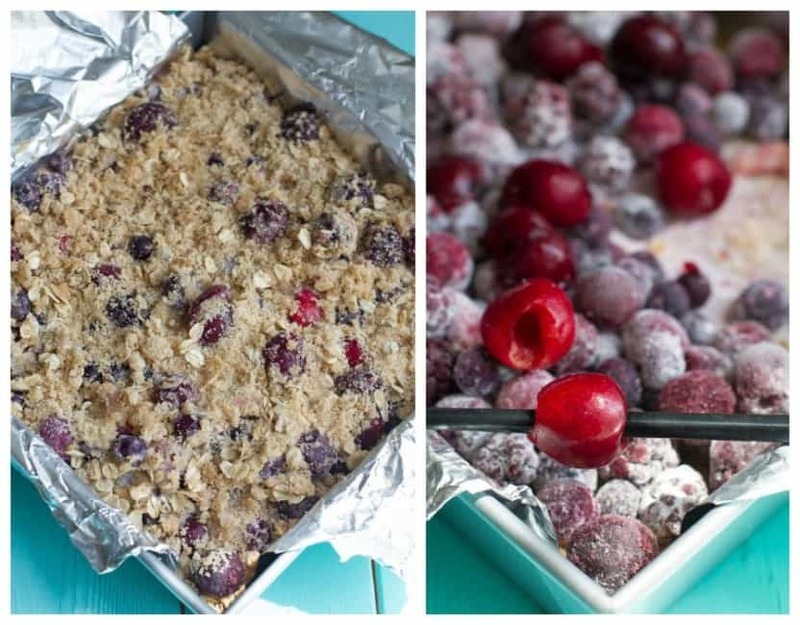 These Fresh Cherry Berry Crumble Bars couldn’t be more simpler to make. 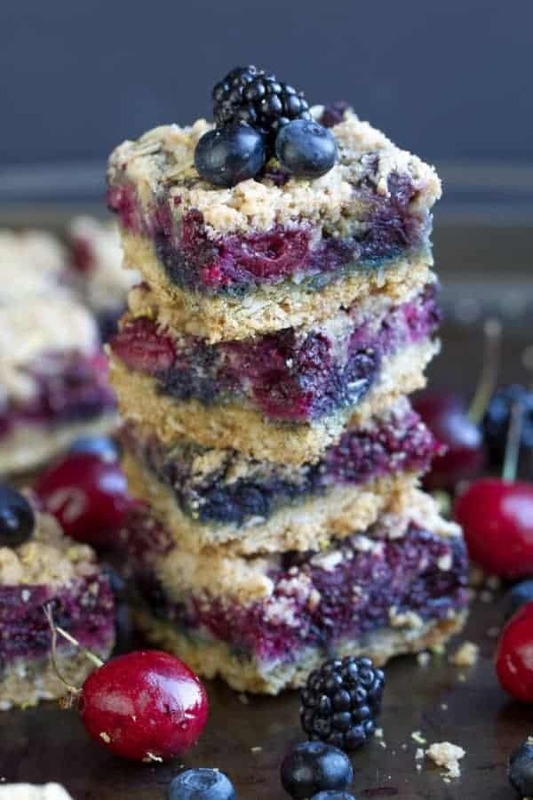 With a buttery oatmeal crust that doubles as the topping and filled with juicy sweet cherries, blueberries and blackberries — you will love all the wonderful textures and flavors in every bite. I have such a weakness when it comes to streusel topping so I usually reserve making those treats whenever I know we have people to share them with. I made these bars using a 9 x 9 inch baking pan back in June and they were the perfect size to take along to a summer afternoon tea party we threw which you can read about HERE. Summer just isn’t summer without one (or several) crumb bars. So whip up a batch for your next barbecue, potluck or summer party or for an indulgent afternoon treat warmed up with a scoop of ice cream. 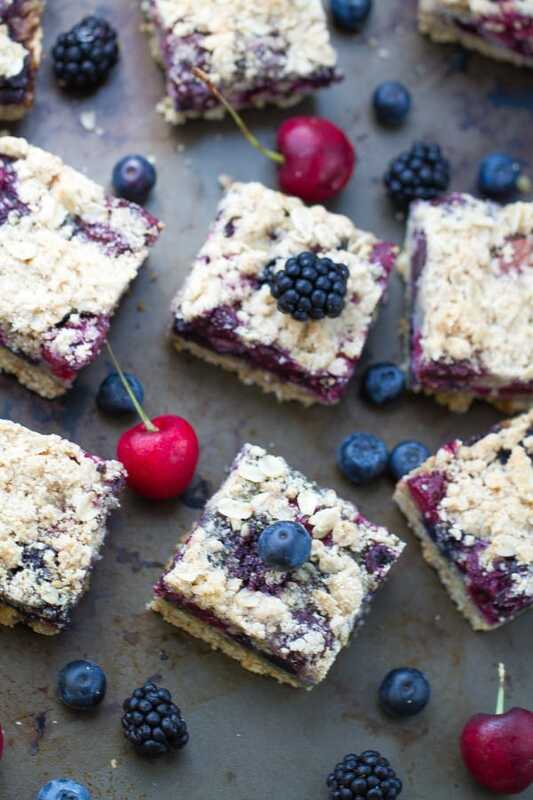 Easy and delicious crumble bars made with fresh cherries, mixed berries, and a buttery oatmeal streusel crust & topping. Comes together quickly making it the perfect summer dessert. Preheat the oven to 375°F. Line an 8x8 or 9x9-inch pan with parchment paper or aluminum foil and spray with non-stick cooking spray. In a medium bowl, combine the berries and cherries with sugar, cornstarch and lemon juice, and toss to coat. Set aside while you prepare the crumble. Make the crumble: In a large bowl, whisk together the flour, oats, sugars, baking powder, and salt. With a fork, pastry cutter, or your fingertips, cut butter into flour mixture together until it resembles coarse crumbs. Press a little bit more than half of the crumble into the bottom of your prepared pan, patting it down evenly. Evenly sprinkle remaining crumb mixture over berry layer. Berries are my favorite part of summer too! I always seem to stock up whenever I go to the farmer’s market or grocery store. 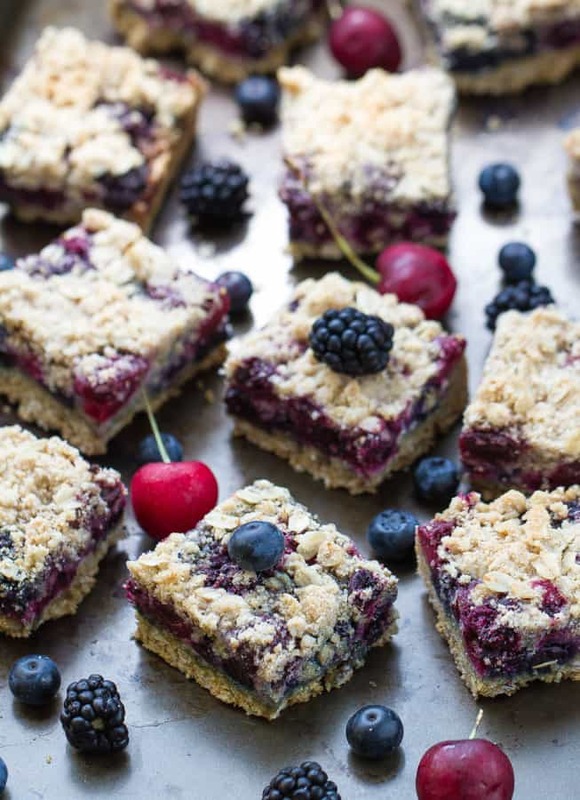 These crumble bars looks delicious, Kelly! I love the cherries and blueberries in here. That topping looks just perfect, too. Sounds like this would make a good breakfast or dessert! Same here, they’re so good right now that I always end up buying more than I plan too 🙂 Thanks Gayle! 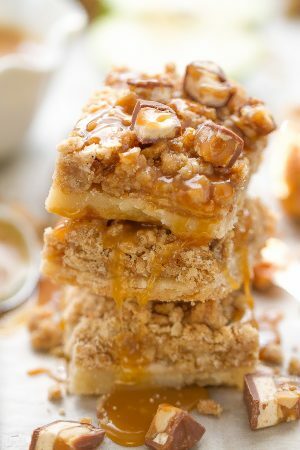 These streusel bars look absolutely stunning! Shared! Kelly, my favorite part about summer is also all the fresh cherries and berries! I can’t get enough and I’m still in summer and fruit eating mode so I LOVE these crumble bars. . they look SO GOOD!!! and I love the bakeware form KitchenAid .. it’s really GREAT quality!! love!!! Oh gosh. 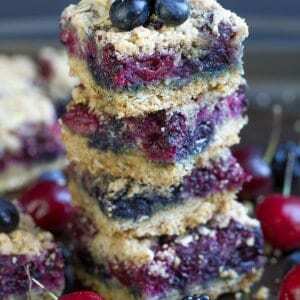 Berry crumb bars are my WEAKNESS! I seriously cannot even stand how amazing these look with all that fresh berry goodness! I’ve been seeing SO many cherry recipes lately, and I want to try them all! Starting with these beauties. 🙂 Pinned! Anything with a streusel is my weakness which is why I can’t make them too often or I will seriously eat the entire thing all by myself 🙂 haha Thanks friend and for pinning! I would take a bar like this over cake or pie any day! These look amazing, those layers are perfect!! Fresh berrries in Summer are a staples in our house too! But, we love them so much I usually can’t bake with them–they’re long GONE! 😀 Love how these bars are busting with them! These look beautiful Kelly. My favourite part about summer is all the berries too, and this looks like the perfect way to use them. I am craving cherries now. I can’t get enough of berries and cherries right now 🙂 Thanks Dannii! Crumble bars are so comforting! They totally are! Thanks for stopping by Tasha! Kelly, that picture is absolutely mouth watering! I was sitting here thinking that with a good cup of coffee, that’d be an amazing breakfast… because I’m grown, I can eat sweets for breakfast! Thanks for sharing! Pinning! Haha yes, since they are packed with fruit, I’d say they are totally acceptable for breakfast 😉 Thanks for sharing and pinning, Amber! These bars are just perfect for summer and berry season! Love them! And your pictures are amazing as usual!Pinned! I always have blueberries in the fridge! It’s one of my favorite fruits. These bars look great and such a great use for all those blueberries. Love that topping, Kelly! Blueberries are one of my favorites too. Thanks Jen! I love the idea of a buttery oatmeal streusel crust loaded with fresh berries! This is a perfect summer treat, my friend! While fresh berries are definitely a highlight of the summer season, I have to agree that the streusel is where it’s at! I could just eat that for a meal and be happy! Love these bars, Kelly! Haha same here, streusel is my favorite. Thanks Eva! The bars look so good Kelly, I am drooling over the crumble topping!! The crumble topping is always my favorite part 🙂 Thanks Manali!! I can never resist the crisp either 🙂 Thanks Izzy! These bars look fabulous! Love the idea of fruit crumble in bar form- pinning! Thanks Medha and for pinning! These photos are gorgeous! I want to eat all of the bars! They look insanely good! Pinning. Thanks Thao and for pinning! I love how thick your fruit filling is in these bars, Kelly! I would totally have one of these for breakfast or to take with me on a hiking trip! These bars looks very tempting, Kelly! I love the crumble topping! Looks delicious! I recently discovered crumble bars of all sorts and I’m hooked. And yours look so vibrant and delicious! The layers are distinct and look perfect. Well done! It’s hard not to be hooked with the crumble topping 🙂 Thanks Oana! These bars are absolutely perfect Kelly! So gorgeous! These look so good! Thick crust, a crumble. YES please! Haha I know what you mean, we can’t get enough fresh berries 🙂 Thanks Ami! I love bars. They are my absolute favorite. I would take bars over any other dessert. These sound and look delicious. That crisp onto is yum!!! 😉 Great job Kelly! Hello, berry goodness! These bars look so stinking delicious! I am seriously wishing I had a few to go with my coffee this morning! When I saw them yesterday on facebook, my jaw dropped! They are SO gorgeous!!! 100% something I need to make this summer!! Making crumble bars is one of my favorite ways to use all of the fresh berries that are in season right now! Delicious! Fresh berries are one of my favorite parts of summer too! Kelly, these look absolutely delicious! I love the topping. And yes, they look absolutely worthy of turning on the oven in this 90 degree weather! Thanks so much Aida! 🙂 Hope you’re having a great week so far! What a beautiful dessert! These are great for all that fresh summer fruit! Kelly! What an absolutely beautiful colour these are! Deffinately going out to get the ingredients for these this weekend! Well these sound delicious. And so easy to vegan-ize too! Thanks Aimee! I’m with you, I make them often with coconut oil and my husband can’t tell the difference 🙂 Hope you’re having a great week so far! These are stunning Kelly! I love fruit crumble, and it sounds even more amazing in this special bar form! Love it! Wow, girl! You are a real chef. This recipe is so easy and quick to make! Definitely recommend it to my friends. Perfect snack for Saturday party it is :-). These seriously look like THE best things EVER!!!! I can’t wait to try one of them :). Or ten. Haha I have to admit, it was hard not to eat ten at a time 😉 Thanks Annie!! Fresh cherries are one of my favorite fruits of summer! I love fruit so much, but there is just something about fresh cherries. These bars look amazing! I love desserts that include berries and these look like the perfect summer treat! I feel the same way, cherry season is really short here so I always try to enjoy as many fresh cherries as I can every summer 🙂 Thanks Keri! Crumble anything is the best thing about summer fruit! These look amazing Kelly! Life has been a bit on the crazy side for me over the past few weeks and I have not had the time to visit your sight as frequently as I would have liked. . .but boy of boy did my eyes get sensory overload today (and my pinterest account was on fire!). You have so many delicious recipes and these bars are no exception. Buttery oat crust? Crumble topping? Cherries? Perfection and definitely worth braving a hot kitchen for. Aaw, I totally understand, Lynn! It’s summer and I know there is a lot going on with you. Hope your family is doing well. Thanks so much for the sweet comment! I can’t get enough of cherries this time of year 🙂 Have a wonderful rest of the week! I too love cherries. They are one of my most favorite fruits! I love all the summer fruits too! These bars look divine! Swooning over here! 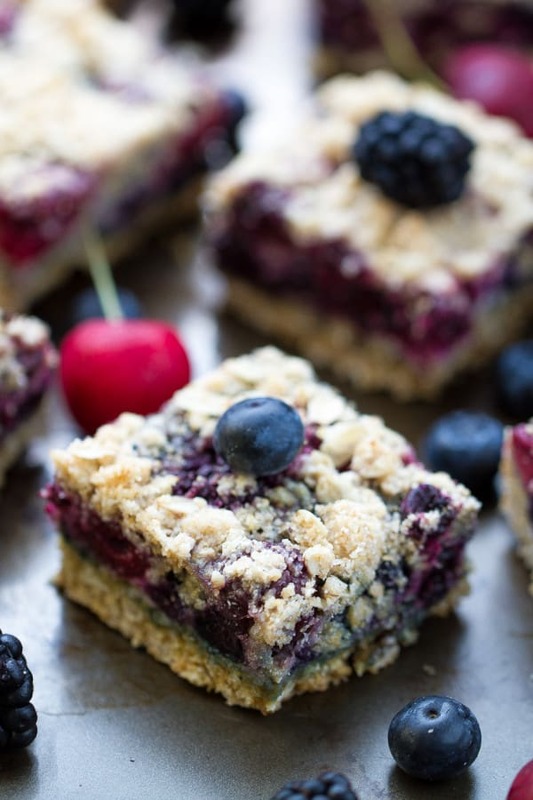 We have a berry explosion going on in our fridge right now, just BEGGING to be turned into these gorgeous bars! I can’t stop staring….so beautiful. Oh man do these look good! Berries are definitely one of the best parts of summer! So yummy! These bars look wonderful Kelly! Perfect for all the summer fruit I have leftover! Hi Kelly, these bars are summer at it’s finest, love everything about them.